Are you looking for relaxing holidays with your friends or family? You've come to the right place! 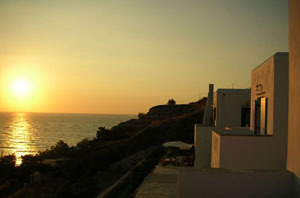 Kritikos traditional guesthouses and studios is placed in Abram Village, one of the most beautiful spots of Naxos Island. The property is 100m away from the beach and surrounded with vineyards from which the famous Naxos wine is produced and you can taste it for free during your stay in our studios. All our studios and guesthouses are fully equipped with kitchen, fridge, air condition, television, double or single beds, private bathroom and big private balconies with a magical view to the sea and the sunset.